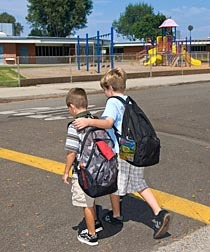 The streets outside a school can be a dangerous area for children. Many young children do not fully understand the dangers associated with street crossings and do not have fully developed perceptual skills. Furthermore, cars parked along the side of the road may hide them from the view of drivers. Children may also be distracted while talking with friends or chasing balls into the street so they do not realize they are in the way of oncoming traffic. According to the U.S. Centers for Disease Control and Prevention (CDC), nearly one-fifth of traffic fatalities among children ages five to nine years old were pedestrians. Children who are struck by a vehicle and survive could potentially face serious injuries, including brain damage, internal injuries, broken bones, learning disabilities and loss of motor skills. It is rare that a child is hit by a vehicle and emerges unscathed. Because of all the dangers around a school, and because of how vulnerable our children are, it is vital that drivers operate their vehicles with the utmost care and concern. Drivers who do not obey the law around a school area put children’s lives at risk. Furthermore, it is important that schools have properly marked crosswalks and provide safe places for children to cross streets. If a child is harmed while crossing the street outside a school and the accident was caused by someone’s negligence, that person or organization can be held liable for any injury to the child. The Killino Firm is concerned with making sure that our children are safe. That is why we filed a nationwide class action lawsuit against Mattel to force the toy maker to pay for the testing of children who were at risk of lead poisoning from its products. In 2007, Mattel recalled 1.5 million toys after it was discovered that they contained lead paint, which is toxic and can cause irreversible brain damage and other injuries in children. When you need a lawyer who will exhaustively investigate a school street crossing injury and make sure that every responsible party is held accountable, contact The Killino Firm, where Keeping America Safe is our primary goal. To speak to one of our attorneys, please fill out the form on this page, call us toll free at 877-875-2927, or email a child injury lawyer today. We will respond promptly to your inquiry so that you can experience The Killino Firm Difference.